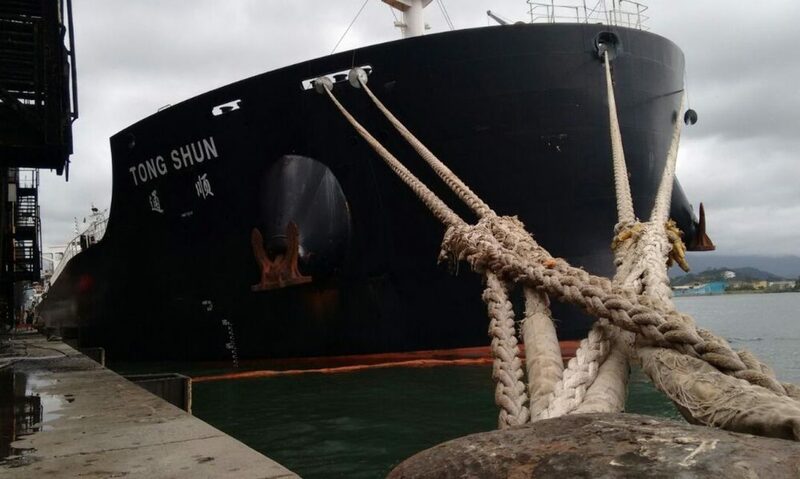 Bulk carrier Tong Shun suffered water ingress after touching the bottom at berth in Santos port, Brazil. 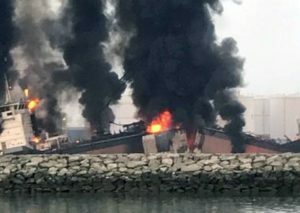 The half-loaded vessel was docked to load 30,850 tons of soy near warehouse 21/22 in the port, but stuck on the bottom at the berth with depth of 13.20 m. In result part of the hull breached and some ballast tanks started flooding. The accident was reported to local authorities and divers were sent at the scene to assess the damage. The cargo handling operations were stopped during estimation of the breaches. Moreover, local authorities laid oil booms around the vessel, as a precaution in case of oil leak. Technicians were also sent at the scene of troubled bulk carrier Tong Shun to check if all ballast pumps are working correctly. Sao Paulo Ports Authority and Brazilian Navy, informed that it sent experts to the vessel and opened an Administrative Inquiry on Accidents and Facts of Navigation (IAFN). The investigation has an initial duration of 90 days and may be extended for the same period if there is a need. “So far, there is no report on the conditions of the hull. There is no reported oil pollution from the vessel”, says the statement of the company operator of the dock. The further salvage will be considered after assessing the damages and the seaworthiness of the ship. There were no reported injuries and water pollution during the incident. Bulk carrier Tong Shun (IMO: 9646211) has overall length of 229.00 m, moulded beam of 32.00 m and maximum draft of 13.00 m. The deadweight of the ship is 81,162 DWT and the gross tonnage is 44,090 GRT. The vessel was built in 2014 by Jiangsu Jinling Ships in their yard in Yizheng, China.